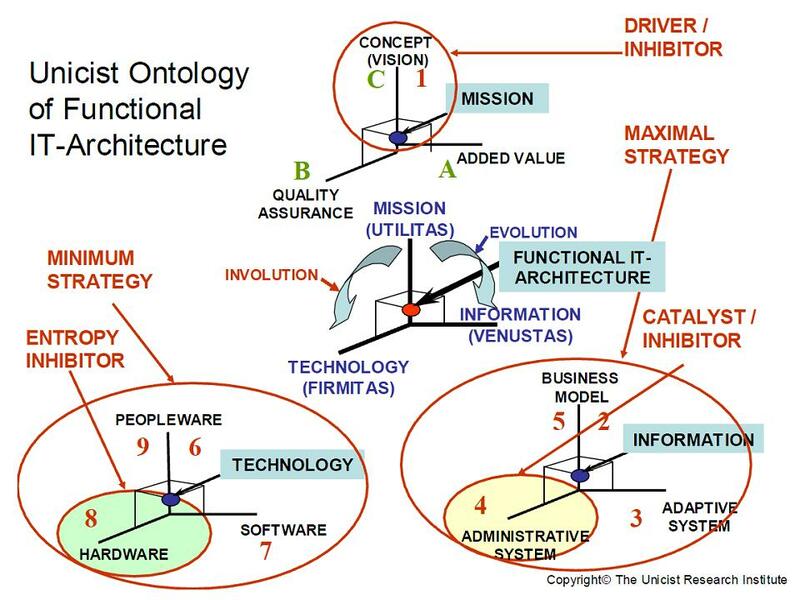 The ontology of the function IT architecture is based on the integration of the elements that are included in software building. 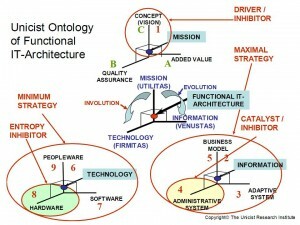 The purpose of the IT architecture is to fulfill the mission of the system that is being built. The mission implies following a concept and generating an added value, having an adequate quality assurance that makes the mission reliable. When the concept is not shared, there is no possibility to develop a structural solution for a system. The concept represents the vision of the activity of the system and needs to be apprehended taking the necessary time to do so. The active function, which defines the aesthetics of the system, is given by the information that is managed by the system. It needs ot be based on the true “business model” because it has to satisfy its needs. The business model is provided by the business architectural approach. Information must include adaptive aspects in order to manage the feed-back from the environment and administrative aspects to ensure the operation and control. The energy conservation function is defined by the technology which sustains its solidity and is integrated by software, hardware and peopleware. Excerpted from Unicist Business Architecture.